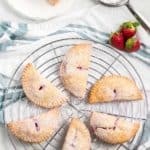 Nature's candy-strawberries, wrapped up in a delicious cream cheese pie crust and baked to perfection! In a stand mixer or hand mixer, process butter, cream cheese and heavy cream until well combined. Add flour and salt, process until dough holds together and will form a ball. Turn out to floured surface and divide in two. Cover with plastic wrap and chill for 30 minutes. Chop strawberries and mix with sugar, salt and cornstarch. Allow to sit 5-10 minutes. Roll out dough into two 12-inch circles. Using a 5-inch bowl or biscuit cutter, cut into rounds. Balling up, rolling out and cutting out any excess dough. Drain strawberries slightly. Place 1 heaping teaspoon into each round. Wet finger with water and dampen edges of each round and fold over. Crimp with back of fork to seal. Beat egg and brush tops of each pie with a pastry brush. Cut slit in top of each pie with knife. Bake in a 400-degree oven for 20-25 minutes or until golden. Allow to cool and dust with powdered sugar if desired.